John Trimingham died in London in 1655. 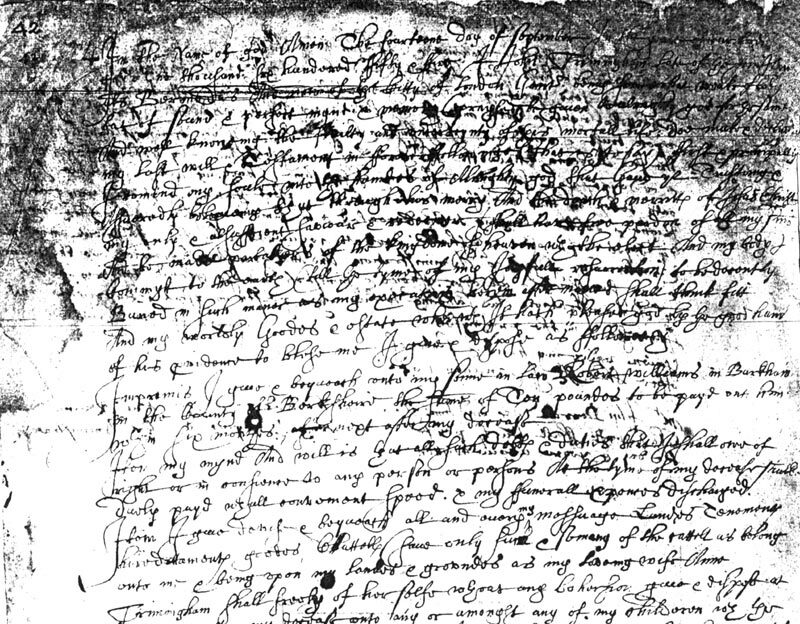 His will, written on 14 September 1655, is written in "secretary hand" of the 1600s, difficult to decipher. Shown above is the first part of his will. Near the bottom of this section of the will can be seen "my loving wife Ann Trimingham." John was baptized 10 January 1590 in the small village of Fishlake, Yorkshire, England, according to a Trimingham family historian, Andrew Trimingham. He came to Bermuda in the early 1620s as an agent of one of the investors in the Bermuda Company. His wife and family came with him and settled in Bermuda. He was elected governor in 1649 for a short time, the only governor to be elected rather than appointed. John left a widow, Ann, mentioned in his will. She had a son, John's stepson, mentioned in the will, and is thought to have been married previously to someone named Williams. His stepson, Robert Williams was left ten pounds. His son Paul was to have all his real and personal property at the death of his mother, Ann Trimingham. John Vaughn and his "now wife" - daughter Ann - were left property in St. George. His daughter Bridget, married to Jonothan Turner, is not mentioned. The will was proved 25 January 1655/56. Bermuda Archives, Will Book E , p.42.